In A HOUSE OF BOTTLES, Robin Merrill writes with verve and wit. Whether she is taking us on a hospital ship to Africa or just next door, the journey is always into the depths of the human heart. Her faith is big enough to be both funny and frank, to grieve the world's terrible wounds and celebrate our enduring grit. These poems call us to compassion. Like prophecies written in lipstick across a mirror, we can't help but see, and can't possibly refuse Merrill's compelling vision. Funny, harrowing, sad, animate: the poems gathered in Robin Merrill's A HOUSE OF BOTTLES are artful although unadorned, edgy and troubling &#40;the way American life is edgy and troubling&#41;. and they are unshakeable--as if a rose with a canker had unfolded and spent its blooms before you. Merrill's vision isn't beautiful: it's just overwhelmingly real. These are "dare you" poems: they dare you to be vulnerable and to see. If you take the dare, you may not be glad, but you will be enriched. in four foot letters spanning the wall. 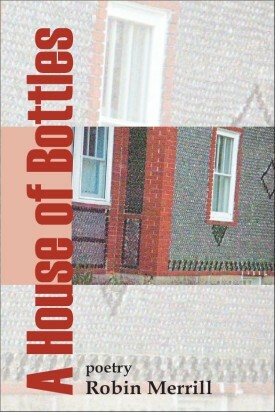 and to build a house of bottles. open summer Saturdays, noon to four. another collects donations at the door. The only attraction in a town that boasts of quiet. in perfect symmetry, corners precisely ninety degrees. fingers deft inside deerskin, chaps stiff with grout. lit a smoke and said I built that. proud, satisfied and dreaming of making.